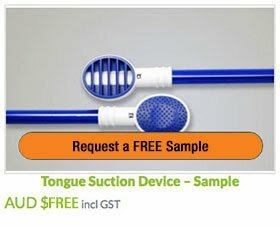 The Tongue Vacuum Cleaner by TS1 is the future of tongue sanitation! The tongue contributes to approximately 57% of the total bacteria found in the human mouth and plays a leading role in intra-oral causes of halitosis. Oral cleansing should therefore also include deep-cleansing of the tongue, and now it has never been easier! Apply a small drop of tongue cleaning gel (Optional) to the knobbly side of the TS1 Tongue Vacuum Cleaner. Fix the tongue carefully with some moist gauze and then spread the cleaning gel evenly from the back to the top of the tongue. Turn over the TS1 Tongue Vacuum Cleaner and gently apply the side with the lamellae to the tongue. Gently move the TS1 backwards and forwards on the tongue from the tip to the back in order to raise up the tongue papillae. Finally evenly vacuum the tongue to remove the tongue plaque.